Make sure you dont cheat! E-mail me at the bottom of the page. I will write you back telling you if you are on the crew or not. I just want to remind everyone that Slayer[KAC] is now the head of KAC. If you have any questions about KAC ask him. Also All Kac Members pleaseE-mail me with your multiplayer name and the name of your gun that you use in DF2 and your first name so I can put you on te squad list. Thank you. This page is dedicated to Delta Force 2. It is the greatest game in the world. I think, and I'm sure you think so to or else why would you be coming to our page. Our one goal on Multiplayer is to Kill All Of The Cheaterz. That is why we have developed a squad called " KAC " which stands for Kill All Cheaterz. 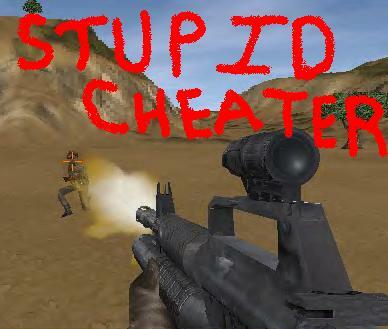 Now I know I have links to cheat sites but that is only so we have more cheaterz to kill. In order to get onto the KAC squad you will need to E-mail me with your First Name and your multiplayer name, some info on yourself and what gun you prefer to use. I will write back to you as soon as I can, telling you the info on the team. Thank you for visiting my webpage and I hope to see you on the field. Right now our team mostly plays on the team deathmatch and team king of the hill. Sometimes we play on other maps but those are the main ones.Click Here Make sure you Kill those stupid CHEATERZ!!! !